MIRIAM : The Escape full walkthrough, cheats, guide for android and ios devices. In Miriam you will go on an adventure inside a girl's strange dreams. Below I'm going to explain, step by step, how to pass the 24 levels / stages in MIRIAM : The Escape. You can either follow my text guide or take a look at the video at the bottom of the page. Level 1-1: Start by pushing the bridge on the right to block the light. The move to the left side and push the box down on the button. Now walk on the floating boulders and get the key. Level 1-2: Start by pressing the button on the right. Push the box to the left until it falls on the other button. Now just go up with the moving platforms until you reach the key. Level 1-3: Go down with the lift. The key is on the right side, the door on the left side. Level 1-4: Go down with the lift and up with the second lift. Press the button that makes the lights spin. Go up again with the next elevator and you'll find the key. The door is after passing some moving platforms. Level 1-5: Go down with the elevators and jump the platforms, also be careful on the moving saws. The button that turns of the light is above the pendulum blade. The key is right across the button. Level 1-6: Stay in the shade of the moving platform to pass the first light. The just don't get hit by anything that can hurt you and you'll reach the key soon. Level 2-1: Go down with the elevator on the right side. Use the box to block the light and go down further. When you reach the group of 4 boxes you'll need to push 1 of them off the platform and the platform will start going up. As you go up hide between the boxes to avoid the light. Level 2-2: Get in the elevator and use the button on the left to turn off the light on the right (jump over the swinging blade). Go down with the other elevator and move forward until the next button that will release some water in a different area which will short circuit the final light. Level 2-3: Start going to the right, jump over the swinging blade and avoid the spinning saws. Get the key than use the button to turn off the light, afterwards push the box and climb on it to reach the door. Level 2-4: Use the elevator and fall down, avoiding the light. Push the box and use it to climb above. Now to go further up, you will notice a shadow in the moving light, it's actually an invisible platform there, so jump on it! To get past the log with spikes you'll need to lift it up by alternatively standing on the 2 buttons. If the hooks disconnect just restart the area. Level 2-5: Push the box down and jump on it. After you get the key you'll need to push the second box into the water, just push it little by little and run back when the blade comes towards you. Near the end of the level you'll find a light on a box, you need to move the box back a bit until it gets under the platform next to the elevator. After you jump to the other side drag the box with the light back on the button where it initially was. Level 2-6: Jump down on the right side, press the button that releases the water and climb on the small box on the left. Get the key and go back down. Stay on the button to make the water go down. Level 3-1: Stand on the ground button to lower the bridge, than press the button on top to lower the crane, afterwards go under the crane and push it from inside, past the light. Get past the traps and when you reach the big box, push it into the water (there's a button there). Now push the crane abofe the water and climb on it to get over the swamp. Level 3-2: Ride the elevator and press the button on the right. Climb up more and press the flashing button. Above the water there are invisible blocks... 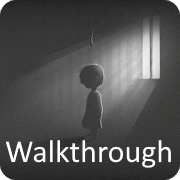 When you reach the other side press the black button to lower the water, than jump down and walk towards the door. Level 3-3: When you reach the pile of crates, you need to push 2 of them off the platform and it will move up then. On the next platform push off the big crate. To get the key you must walk on the log as the water is rising and lifts the log. Now drag the last crate back and climb on it to reach the button. Level 3-4: Start by dragging the 4 crates so the water will lift them and they will push the 4 top buttons. To get past the "bear trap" jump in the middle of it when it's opened. Level 3-5: Push down the crate when the moving light is above you. The rest of the traps in this level are all about good timing, so you can manage to pass them after you learn the patterns. Level 4-1: Climb up where the crates are and push all of them down on the platform. When you reach the crane lower it down than lift it up. This will release the floating crates underneath, and you can pass the water on them. Now when you reach the invisible platforms you need to first jump straight down, then jump over the first platform. The rest of them are kind of like a staircase, so just walk... To get the key first push the box in the on the spikes inside the gap. Now passing the spinning saw is kind of tricky, but 3 jumps over it are enough. Level 4-2: To get past the fist light just walk slowly and stay in shades. Now when the rolling spikes ball comes you'll need to jump over it. When you get near the end just push the big box next to the small crates and press the button to lift all of the up. Level 4-5: When you reach the first button, press it to start the rotating platforms. Now climb on the first platform and jump on the next platforms at the right moment. In the next area there's a big round button, you have to stay on it 5-10 seconds to push it down all the way. Go down with the elevator and grab the key. Go back up, than drag the train carts on the top side above each suspended platform. Now you should be able to easily cross the area on the suspended platforms. Level 4-6: When you reach the "Gravity Area" just fall right down, than pass under the spinning lights and jump up to get the key. Now return and go down with the elevator. Use the button on the far right to lower the cranes. Than press each buton on the 3 cranes. Go to the left side now and push the boulder on the button that turns off the light. Get back up with the elevator, and get down again using the other elevator. Congratulations you just finished MIRIAM : The Escape! MIRIAM : The Escape Cheats, Solution, Walkthrough for Android, iPhone, iPad, iPod.